When it comes to the Michelin Guide, one generally thinks of the high-end restaurants with dishes served as mini art pieces atop white linen table covers. Which is why it's interesting to think that Ogeunnae Dakgalbi, which specializes in the humble dish of dakgalbi, is a Michelin Guide-selected restaurant. Granted it is a Bib Gourmand restaurant but still, dakgalbi's origins stems from humble times when it was a solution to quickly and easily feed blue collar workers during, and after, a hard day's work. I mean, even the dish's makeup is simple and humble to the core: marinated chicken stir-fried with vegetables. I was thus all the more curious to see what the Michelin Guide saw in this restaurant over the many other dakgalbi restaurants and chains scattered throughout the capital. Even prior to its MG mention though, Ogeunnae Dakgalbi was already well known. 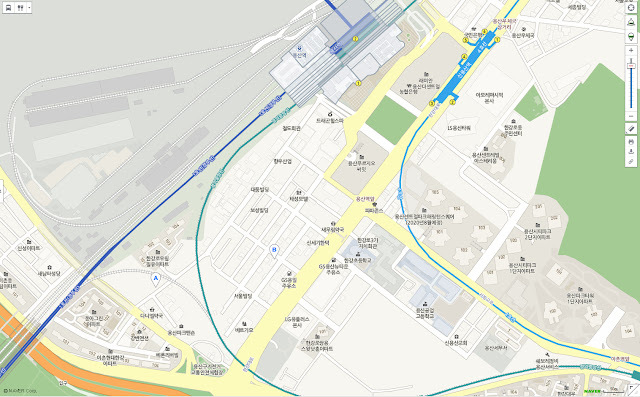 The restaurant's proximity is located south of Sinyongsan Station, just between the station and the Han River. The restaurant's neighborhood is bisected by railroad tracks with trains going and coming through it even to this day. Like most neighborhoods built around railroad tracks, Ogeunnae's neighborhood isn't the most premium in Seoul and the restaurant has long catered mostly to the many blue collar workers from the various shops and factories that used to be predominant here. Dakgalbi, like other barbecue dishes, often sprang up from middle, blue-collar neighborhoods not only because of their cheap and filling value but because it works well for groups. I don't know the exact origin story of Ogeunnae but logically my guess would be that this is one of the strong reasons Ogeunnae grew in popularity. Its original, smaller restaurant still exists in the same spot, just by the railroad tracks, but its popularity boom (even before its MG mention) led to the restaurant opening a second restaurant just a hundred meter or so away from the original location. The second restaurant is far larger and in a much modern environment and if you're seeking out the restaurant at peak hours, you're likely to have to wait less and/or get seated right away at the second location. This is what I did and to be clear, this review, including pictures, are based on my visit to the second location. When you enter, you have the option to choose how you want your dakgalbi cooked: either over an open-fire, charcoal-fueled barbecue style manner or on a hot pan, ala stir fry. Dakgalbi is normally prepared in one of the two above mentioned ways but the latter seems to be the representative option for Ogeunnae. But you'll have to let the workers know beforehand as the table set-up (and section) is different depending on which format you choose. A serving of dakgalbi sets you back 11K with the option to add a myriad of other toppings such as ramen noodles, rice cakes, cheese, sweet potatoes, udon noodles, jjolmyeon noodles, etc with extra toppings costing between 2.5K~3K. They also offer common sides like gyeranjjim (5K) and nurungji dwenjang jjigae (3K) but it also has many Gangwon Province-derived sides on the menu as well including the savory buckwheat crepe-like dish of jeonbyeon (6K) and maemil makguksu (7K for either the regular or the mixed variety). I've also heard good things about their grilled meoktae, or grilled pollack fish that's been pre-dried, which is said to have a pleasant tenacity quality to it but I did not try it out (it's 10K if you want to try though). Regular Korean alcohol are all on the menu from makgeolli (3K) to baekseju (8K). Regular sides include a simple chives kimchi, baek kimchi, cabbage salad, sliced garlic cloves and ssamjang, and a spicy soybean sprout soup. The pan of dakgalbi comes out looking like any regular dakgalbi with the seasoned meat in the center and surrounded in a ring by various vegetables. They're quite generous with the perilla leaves as you can see. As with any dishes cooked at your table, the waiting is the hard part but luckily (for the most part) the servers will come and take care of most of the cooking for you. A relief really as the chicken is fresh (uncooked) and seasoned in red so for the untrained eye it's difficult to visually check that the chicken is thoroughly cooked. Initially it looks like there's mostly only cabbage in the mixture but as the cabbage cooks and reduces you can see there's a good amount of chicken as well. Despite the red seasoning, the dakgalbi here is very much tame. Instead of heat, what one notices is there's a mellow sweet and just the slightest hint of tang to it. It's not a cloying sweetness but just a mild underlining tone which I found intriguing. I later learned that the marinade is homemade using a combination of gochujang along with the fresh concentrated juice of fruits like apples and pears which is then mixed into the chicken and allowed to marinate beforehand. Turmeric is also evident in the flavors here. Like most Koreans, I'm a big fan of ssam (lettuce wraps) for my barbecued protein but in Ogeunnae's case I found myself not reaching for the provided lettuce because of the chicken's amazing texture. Superbly tender and moist, I realized part of the reason the marinade wasn't so strong here was because there was no need to hide the wonderful texture of the meat which owes to the fact that all the meat is thigh meat-based. And we all know that the thigh is at the top of the texture pyramid when it comes to poultry. No chalky white meat here, it's all smooth and groove, brownnnnnnn meat up in hereeeeeee. The makguksu is nice enough as a palate cleanser. Nothing extraordinary but nothing offensive. It wouldn't be a dakgalbi meal without makguksu on the side though. The gyeranjjim (steamed eggs) is a popular option here and is a bit different from others in that it's mixed with flying egg roe. Like any good gyeranjjim, the bubbling thing comes with the consistency of a little cloud with its milder profile a good contrast to the more complex dakgalbi dish. But let's be real, the true meal-finisher of any Korean table side barbecuing/stir frying dish is the fried rice. Some may wonder what the big huzzah about fried rice is but let's remember that that pan, at the end of your main meal, holds all the cooked flavorful bits and pieces that's a shame to lose. Not to mention it's not easy to recreate that level of heat in a standard home kitchen- and we all know how essential high heat is to a good fried rice. Fry it up, let it soak up the flavors and also develop that nice crunchy coating. Toss in some cheese atop if you're feeling sinful and how can one be left wanting any more? The simple but soul-comforting and nourishing properties of this dish is one that can be enjoyed across the spectrum by all ages and backgrounds. At their basic level, the chicken is cooked superbly so that it’s tender and without a gamey scent. But add to that the addictive sauce and that refreshing and appetite awakening kimchi and that makes this the best dakhanmari I’ve come across yet. Come out of exit 3 of Sinyongsan Station and walk along the main road for about 500m until you get to Hangangdae-ro 11-gil and turn right. Walk up the street for about 65m and you'll see the restaurant on your left. N/A but on weekend evenings you may be allowed to park in front of the restaurant when street parking isn't being strongly enforced.